We’ve reached Burgos – one third complete. Over the past 288 km we’ve walked across a wide spectrum of landscapes – forests, parks, vineyards, wheat fields, along busy roads, through small villages and sizeable cities. To witness the flora fluctuate with the changing character of the terrain is truly fascinating – and it’s only spring! One of the most meritable of consumable plants encountered thus far is the refreshingly snappy watercress, nasturtium officinale. A perennial plant in the Brassicaceae family (along with well-known garden vegetables such as cabbage, broccoli, kale & mustard), this vivacious vegetation is fast growing, semi – aquatic, and quite the sight in the streams, ditches and dykes along the Camino. 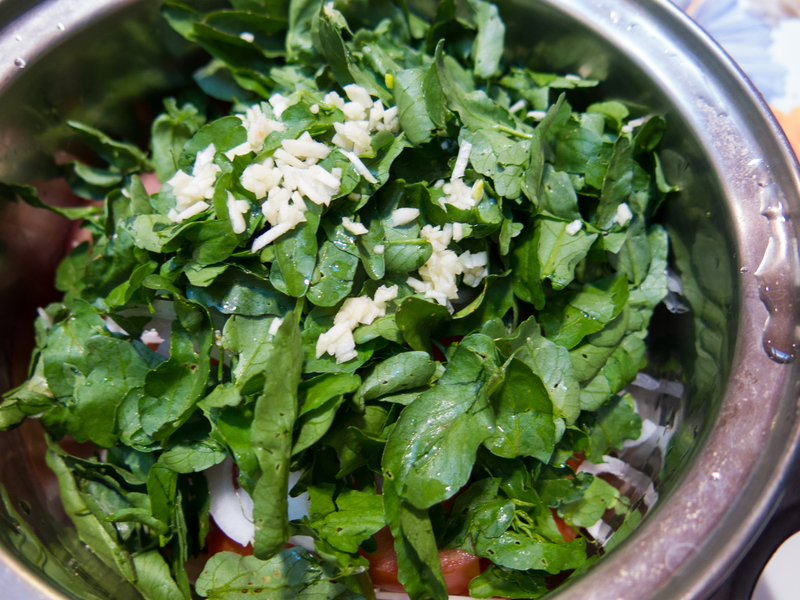 If there’s shallow running water you’ll probably find a lush, dense mat of watercress. Watercress (left) often grows alongside “fool’s watercress” Apium nodiflorum (right). 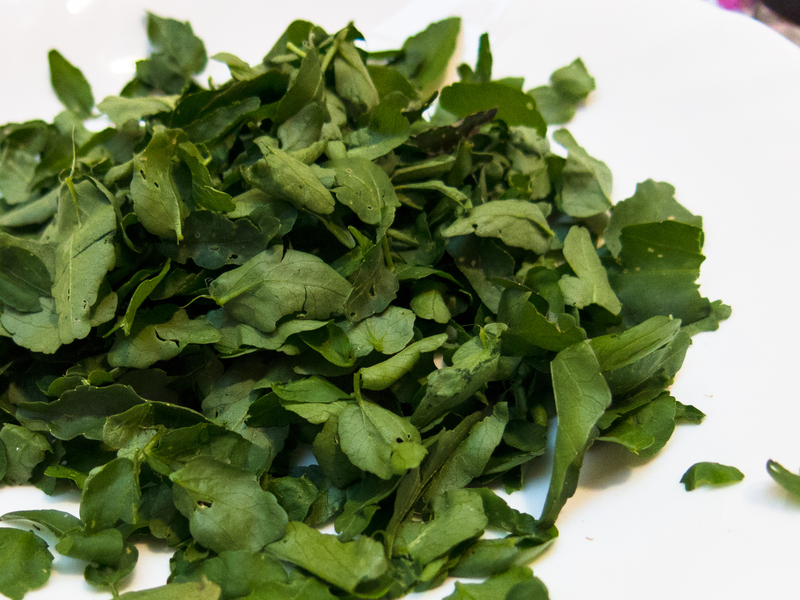 Also edible, fool’s watercress has a similar taste and can be used as a replacement or additional green. 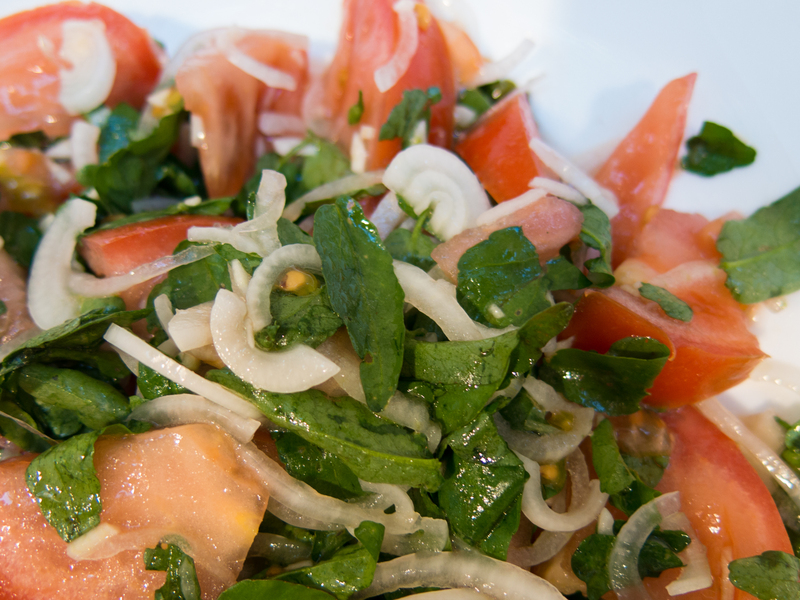 “Nasturtium” literally translated means “twisting nose,” the Roman name for watercress. It certainly has a peppery bite! Not only does watercress provide a gorgeous green blanket for the eye to lay on, the leafy green also contains a wealth of nutrients such as iron, calcium, iodine, folic acid, and vitamins A and C. It’s also a stimulant, diuretic, expectorant, digestive aid and a great source of phytochemicals and antioxidants – all superb comestible qualities for the hungry pilgrim on a tight budget. Tomer harvests for the evening dinner. A short to medium, hairless plant. The stems are thick and succulent. Native to Europe and Asia, impressive beds such as this can be found along the Camino Frances. There are many wonderful ways to utilise watercress, and we’ve come up with a simple, delicious salad with a zestful nip. Remove leaves from stem & wash thoroughly. 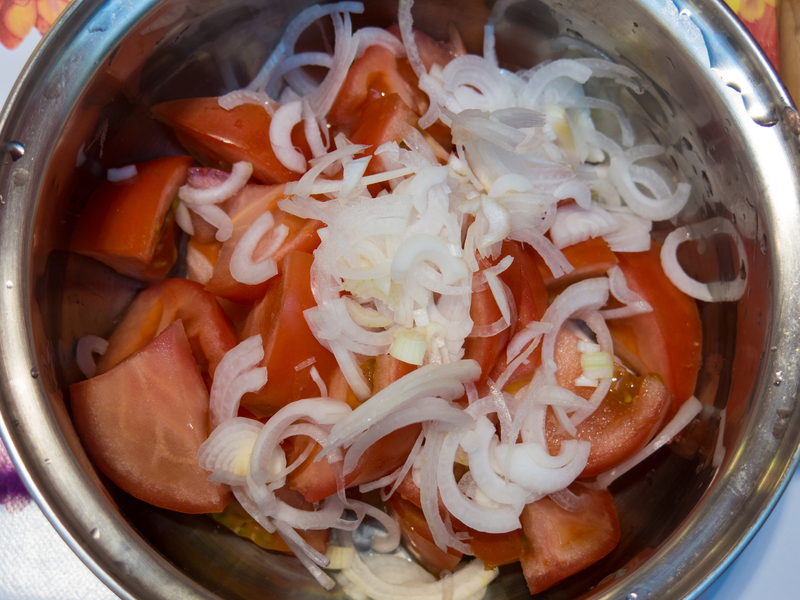 Cut large chunks of tomato & thinly slice onion. Add chopped garlic, salt & the juice of half a lemon. Lightly mix, let sit for 3 or so minutes. Drizzle with olive oil, gently mix & enjoy! ← Finally – the opportunity to cook!